Pumpkin dosa is a variety dosa which does not require any fermentation. This dosa adds nutrition to our daily diet. Crispy dosas which could be made in two methods either by concentric circles or similar to rava dosa with holes in it. These no-ferment dosas are easy to prepare also save you a lot of time. You could prepare these dosas for breakfast, dinner or even for brunch. 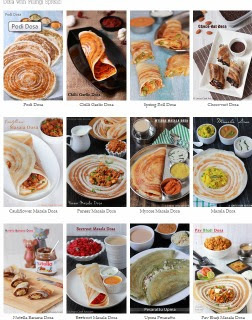 Best dosas which could be made when you have no prior plan for breakfast or dinner. About the taste of the dosa these are spicy, garlicky and crispy. 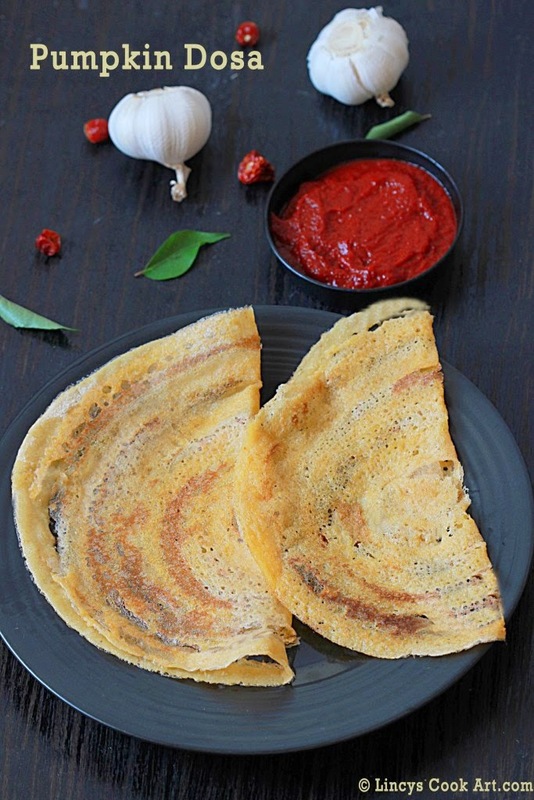 This dosa goes well with any kind of chutneys and sambar or chutney powders. Wash and soak the rice in enough water to immerse. Drain the water and keep the rice, chopped pumpkin, dry red chillies, garlic, jeera, asafetida and salt inside the blender jar and grind to make a fine paste by adding around 1 cup of water. Make sure there are no unground pieces. Transfer the batter inside the bowl and add about two cups of water to dilute the batter and add salt if required. Batter should be thin. Heat a tawa and grease with oil; add a ladle full of batter and make concentric circles. Drizzle with half a teaspoon of oil and roast the dosas till crispy. It takes longer time to cook than regular dosa. Heat a tawa to high heat and pour the batter from edges to the centre and fill the gaps with batter. Drizzle oil on top and roast well till crispy. Once it is cooked you could easily remove the dosa from the pan. Do not flip and cook the dosas. You could make this same dosa with normal dosa batter by grinding ingredients except rice as a fine paste and add in to the dosa batter and mix well. You could sprinkle some onion in the tawa and drizzle the pumpkin batter and make dosas similar to onion rava dosas.